Ultrasonic wave vibration creates an intense cleaning action, the microscopic bubbles can penetrate the most inaccessible parts to remove unwanted dirt. 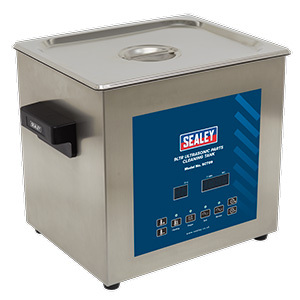 Achieve a pristine condition without any damage or wear to an item with this ultrasonic cleaner. The microscopic bubbles that are created by the ultrasonic wave vibrations can penetrate the most inaccessible parts to remove any dirt and grime which could be reducing performance or preventing operation. 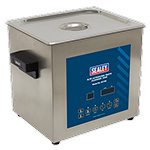 Features adjustable temperature and timer settings, up to 80°c or 99 minutes. The internal dimensions of the tank are 150mm high x 300mm wide x 240mm deep, the stainless steel basket is provided to help keep smaller components together during the cleaning progress.